THE FUTURE PERFECT PROJECT is an ongoing series of workshops, designed to provide LGBTQ high school students and student allies with songwriting & storytelling techniques and the opportunity to express their unique vision to their community. 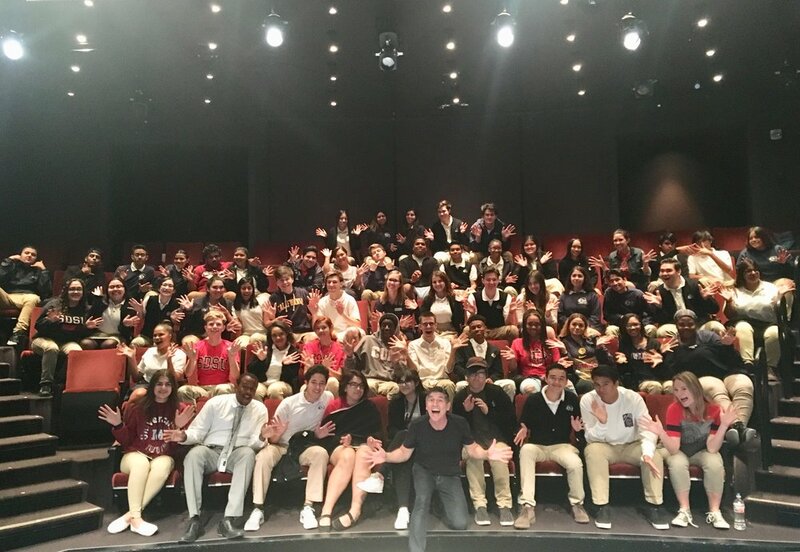 The workshops take place at various schools and community centers across the U.S. and are facilitated by performance artists James Lecesne & Ryan Amador. For many queer youth, finding a safe space is an ordeal. Even in today’s seemingly progressive world, these kids are often dismissed, bullied, and cornered into making a life for themselves on the sidelines. Giving them the space to fully be themselves is an essential first step in the process. The workshop provides the students with specific prompts and assignments to further their reflection on LGBTQ life or on topics they want to address head-on. Throughout the process students are offered the tools to transform their reflections into performance, and ultimately, into a collaborative songwriting exercise. The culmination of the workshop is a performance of some kind, either for themselves or presented to the school, depending on what the school can accommodate. The workshop succeeds in creating pathways for self-discovery, not only within the individual students, but also within the larger system in which the individual functions. By creating safe spaces for young LGBTQ students to speak out, we extend the limits of those safe spaces until they include the entire school and community. It is only by telling our stories that we come to accept one another for who we are, understand who we might become, and realize that we are one. indicates that an action will have been completed (finished or "perfected") at some point in the future. "We will have created a new world by this time next year." JAMES LECESNE wrote the short film TREVOR, which won an Academy Award for Best Live Action Short and inspired the founding of The Trevor Project, the only nationwide 24-hour suicide prevention and crisis intervention Lifeline for LGBT and Questioning youth. He has written three novels for young adults, and created The Letter Q, a collection of letters by Queer writers written to their younger selves. Lecesne was the executive producer of After The Storm, a documentary film that tells the story of 12 young people living in the wake of Hurricane Katrina. And his Off Broadway solo show (The Absolute Brightness of Leonard Pelkey) continues to tour the country. RYAN AMADOR is a singer, songwriter, and theater-maker with two full length albums and five EP’s of original music. He is best known for his queer-related music videos “Define Me” & “Spectrum”, as well as his hit song “Instead” with over 3 million listens on Spotify. Most recently, Ryan directed premieres of live theatrical work in Cincinnati and New Orleans, and is currently in development on several music and theater projects.